The Linden House that stands in Church End in 2011 doesn’t seem to have any connection at all with this other Linden House! The modern Linden house became the rectory sometime just after 1900, when it was substantially enlarged and the rector moved in from the Old Rectory in Hills End. 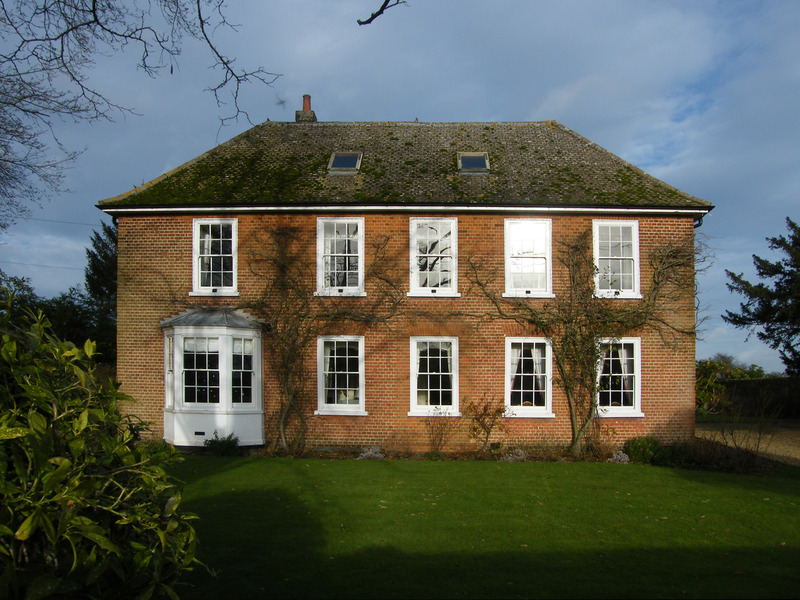 Now the rector lives in Woburn, and the New Rectory has turned into Linden house, a private dwelling again. There are quite a few pictures of Linden House in the miraculously-preserved personal photo album of William Escott Collins, rector 1900-1937. Here’s just one of them as a taster. Unfortunately, they’ve faded badly, but they’re still a great record to have. This photo is from just after the building was enlarged, maybe 1905. The picture below turned up in John Blomfield’s collection, kindly leant by Anna Blomfield.. It’s not known where it comes from. John had a paper copy of a rather dirty copy of a print of what may once have been a watercolour. The version shown here has been photoshopped to greatly enhance the contrast and also to hide many apparent marks of damage. It is, despite all this, recognisably Linden House in Church End! The caption on the print was “Mr. Sandy’s House c. 1820”, with the apostrophe between the “y” and the “s”. Here is an image from a similar viewpoint made in 2012. 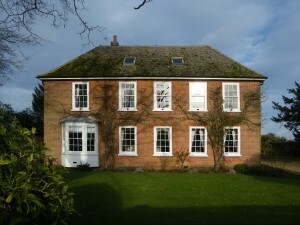 The roofline was altered when the rectory was bought from the church and remade into a private house. The altered brickwork around the 1820 front door is still visible. 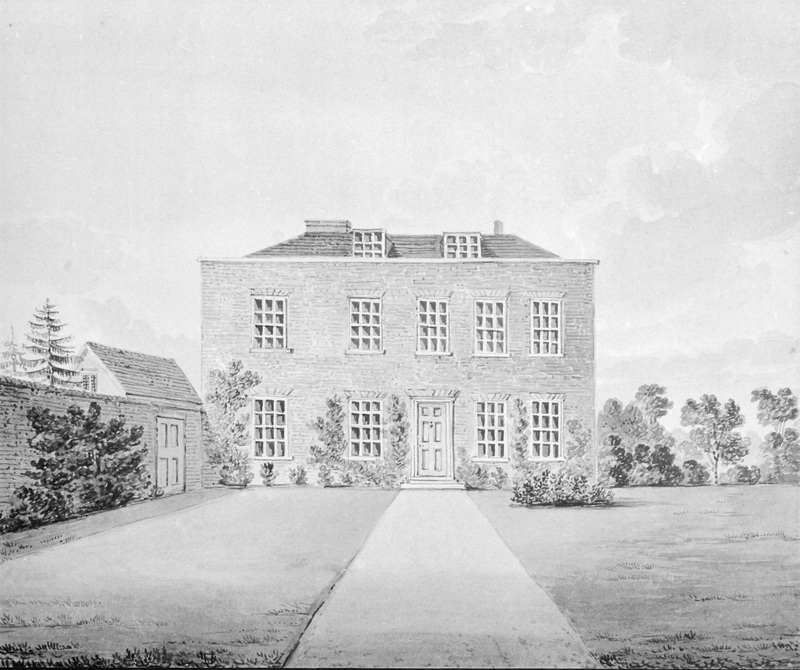 Eversholt house was where Samuel Sandys lived. He was a surgeon, well known and well connected. His address is usually given as “Eversholt House, Woburn” so I (EJW) thought it was in Woburn and thus beneath our notice. However, I discover from The Bedfordshire farm worker in the nineteenth century that it was actually near the church in Eversholt. This is only google books snippet view, so this text is incomplete. It’s also a retyping of a retyping of an edited version of what was probably a bad photocopy of an old fiche of… it would be good to get the original. Mr. Joseph Arch in Bedfordshire. Meeting at Eversholt. On Saturday Mr. Arch, President of the National Agricultural Labourers’ Union, arrived in this county, arrangements having been made for holding two demonstrations – at Eversholt on that day and at Marston on Monday. Mr. S. Sandys, of Eversholt House, near the church, entertained Mr…. There is an “Eversholt House” in Leighton Buzzard and in London, which confuses matters. Kelly’s 1885 says that Thomas Godfrey, a farmer, lived there. 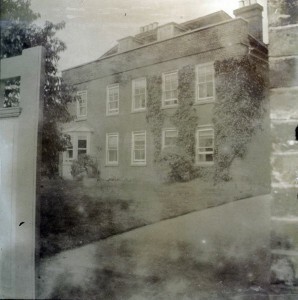 Sandys lived in Eversholt House from at least 1864 until he died in 1878. Geroge M Hipwell, farm Bailiff to the Duke, lived there according to Kelly’s 1890, which seems to be the last mention. April 20, at Eversholt, by the Rev. C. Brereton, M.A., assisted by the Rev. W. S. Baker, M.A., G Annesley D Mahon, Esq., M.R.C.S.E., &c., of High-street, Swindon, eldest son of the late Rev. G. W. Mahon, M.A., Chaplain H.E.I.C.S., Madrs, to Agnes Amelia, second daughter of Samuel Sandys, Esq., M.R.C.S.E., &c., of Eversholt House, near Woburn, Beds. MRCSE could be Member of the Royal College of Surgeons of Edinburgh. HEICS could be Honourable East India Company Service. August 25, at Aspley Guise, Woburn, Beds, Agnes Amelia, wife of G. A. D. Mahon, Esq., and daughter of S. Sandys, Esq., of Eversholt, Beds, aged 31. On the 1st inst., at Hamilton-terrace, St John’s-wood, at the advanced age of 93, Ann, Relict of Thomas Sandys, Esq., late of Eversholt, Beds. On the 18th inst., at Southsea, Sarah of Samuel Sandy, M.R.C.S., London, and formerly of Eversholt, Beds, aged 94. From The Morning Chronicle, 7 Feb 1859, in the section just below the Court Circular. The Baron Vietinghoff, from Paris; Mr. and Mrs. Dashwood Watts Ricketts, from Eversholt House, Woburn, Bedfordshire. Where was Eversholt House? Was it what we now call Linden House? The King has been pleased to give and grant unto Dash Poyntz Ricketts, Esq., Engineer-in-chief Peking-Mukden Railway, His Majesty’s Royal Licence and authority to wear the insignia of the Fourth Class of the Order of the Excellent Crop, which decoration has been conferred upon him by the President of the Republic of China in recognition of valuable services rendered by him. Whoever knew that there was a son of Eversholt with a medal from the President of China? The picture shown as the second picture is almost certainly Church Farm and not Linden House (New Rectory, Eversholt House). Oh dear, you were entirely correct, thank you for bringing it to my attention. I put the right picture back. Does that look better now?